The Orlando Magic are not messing around in free agency this year. Besides trading for forward Serge Ibaka, Orlando has made some other moves as well. Orlando signed guard D.J. Augustin to a 4 year, $29M deal. They have also resigned forward Evan Fournier to a 5 year, $85M deal. Orlando was also able to sign foward Jeff Green to a one year, $15M deal. Orlando signing forward Jeff Green was a smart move. I can see Jeff Green fitting with the Magic. Green has struggled for a couple seasons, but still has an excellent offensive game, very aggressive in transition on offense. 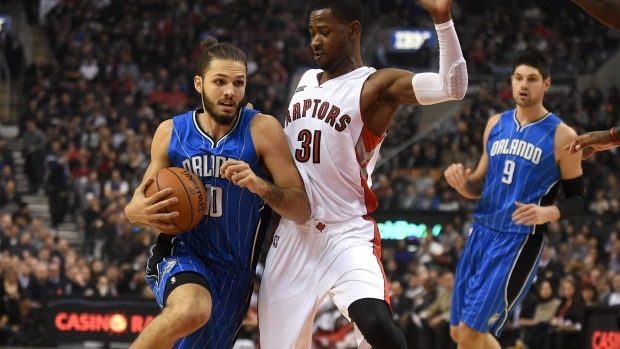 Resigning Evan Fournier was also a great move by the Magic. Fournier is an excellent offensive player and also a great shooter. Last season might of been one of his best and if somehow he can have another amazing season and Jeff Green starts to come around, Orlando can seriously be considered a playoff contending team. Magic point guard Elfrid Payton is the starter for Orlando who is filled with talent and has a bright future ahead of him. Aaron Gordon will be one of the best forwards in the game in the next few years as long as he stays healthy. With an amazing offensive and defensive game and rebounding as well, Gordon on the bench is a big boost for the Orlando’s bench. Let’s not forget about Gordon’s ability to fly, and I mean fly. Magic center Nikola Vucevic is probably one of the most underrated big men in the NBA. An outstanding basketball player with a excellent offensive game, amazing rebounding, amazing defense and a player who can make a huge difference this season for Orlando. Serge Ibaka should have no problem playing alongside with Nikola. Both players are great players on both ends of the floor, but can these two play along together? Can things start clicking in Orlando? Can they make a playoff run? I love family & sports!! Die hard Cavs fan!